Local full-service design firm The Interior Partners was proud to decorate The Providence Group’s new Johns Creek model home at Brookmere at Johns Creek. 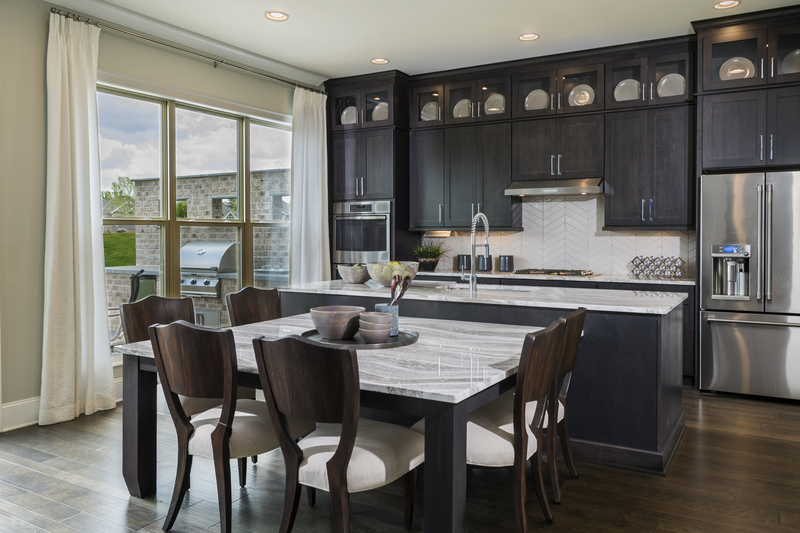 Designed for multi-generational families, The Hatteras model home features transitional furnishings for its suburban locale. The main floor, den and in-law suite took priority with this home design. With this in mind, designers Ashley Norred and Cindi McPherson added variances in those spaces by painting the trim dark and using slightly more traditional furnishings and lighting to make the space feel like it was independent from the rest of the house. The backdrop of the home is cool, subtle and soft with deep peacock accents to add richness. Wallpaper adds texture to secondary spaces including the den, girl’s room and powder room, to name a few. The true heart of this home design is the gourmet kitchen, which boasts an amazing built-in island and breakfast table – the perfect functionality for a busy family! The contrast between the countertops and cabinetry adds the perfect balance between dark and light while the wall-length windows offer plenty of natural light. 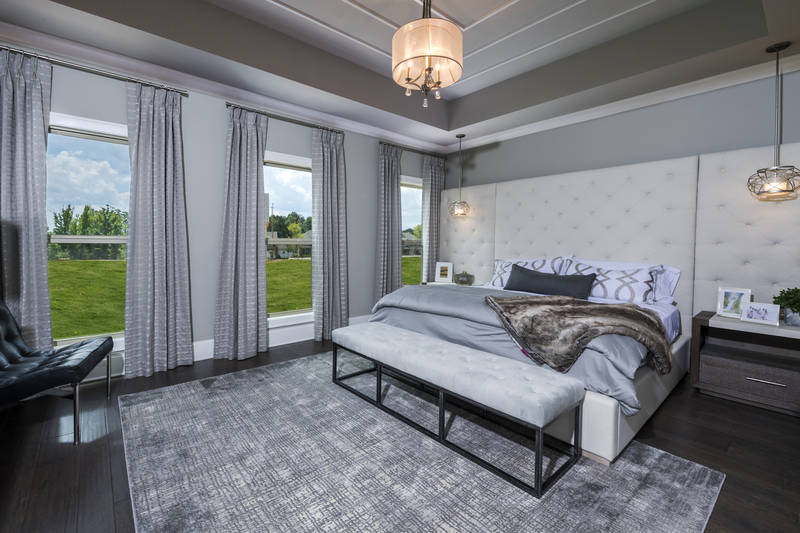 Serving as the perfect escape, the owner’s suite in the Hatteras model home boasts a stunning upholstered wall panel headboard – a piece of art all its own! 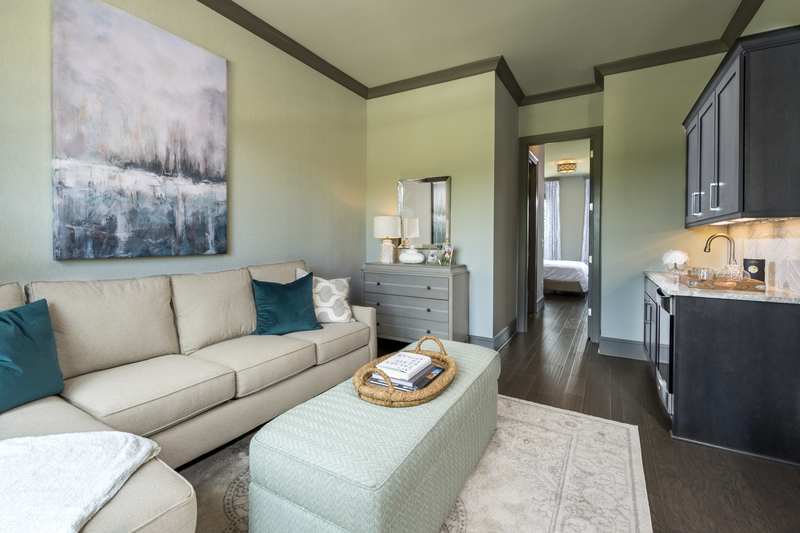 Keeping with the cool color trend of grays and blues, the owner’s suite also features eye-catching light fixtures, wall-length curtains that further elongate the space and ceiling accents. With 30 years combined experience, The Interior Partners can take projects from construction to curtains and transform a space into a unique work of art. Visit the Project Gallery, Facebook and Instagram to see the latest projects and news from The Interior Partners.